BeerViking: ﻿When is a brewery not a brewery? London now has 101 breweries, according to recent figures. Except that it doesn’t – talking to CAMRA folk in the know*, their estimate is that at least 10 to 15 of the brewing companies are actually nomad brewers**, who brew batches from time to time at one of three or four sites where you can go along and rent a commercial-grade brewkit. 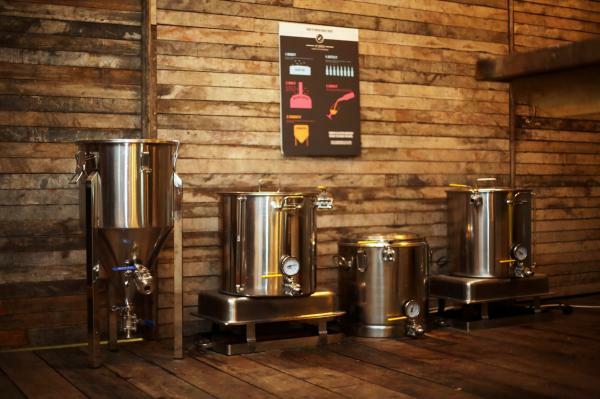 The best known of these ‘open source breweries’ is Ubrew in Bermondsey. Then there’s another half a dozen that are ‘resting’ for whatever reason, and a few more where you have two brewers sharing a brewkit. This all means that the total of actual physical breweries is probably still in the 75-80 region. That means it has pretty much stabilised in the last couple of years. There have been a few closures, but they’ve been more or less matched by new openings – often with the latter using the brewing kit sold off by the former. Sour grapes, or are the nomad brewers genuinely sowing confusion in the market? Their beers certainly look the part, but does actually owning the brewkit make a difference to the quality? *London CAMRA (of which I'm a member) tracks its local brewing closely, even though a lot of it isn’t real ale. It’s partly for completeness and partly because even breweries that mostly do keg beer often also do bottle-conditioned beers and cask-conditioned specials. **Nomad has become popular as the least potentially-offensive of the available terms. ‘Gypsy’ as preferred by the likes of Mikkeller, is regarded by many as pejorative, and ‘cuckoo’ has unpleasant connotations – would you put up with a cuckoo brewer in your brewery if you knew they were planning to elbow your own chicks over the edge of the nest? The London Brewers' Alliance currently has 75 members. Some have more than one operating brewery eg Brewhouse & Kitchen and Laines. Equally some brewpubs are not members. But 75-80 is a good estimate.John Cryne LBA Secretary. Thnks John, it's good to see the figures tie up! I think we will see more nanobreweries/brewpubs coming along soon though - by which I mean under 100 litres - and that's probably going to boost the non-LBA count.